Water for Injection, USP q.s. pH adjusted, when necessary, with hydrochloric acid and/or sodium hydroxide. For Intramuscular (IM) or Intravenous (IV) administration. 3[(cyclopentylhydroxyphenylacetyl)oxy]-1,1-dimethyl pyrrolidinium bromide. The molecular formula is C19H28BrNO3 and the molecular weight is 398.33. Glycopyrrolate occurs as a white, odorless crystalline powder. It is soluble in water and alcohol, and practically insoluble in chloroform and ether. Unlike atropine, glycopyrrolate is completely ionized at physiological pH values. Glycopyrrolate Injection, USP is a clear, colorless, sterile liquid; pH 2.0 – 3.0. The partition coefficient of glycopyrrolate in a n-octanol/water system is 0.304 (log10 P= -1.52) at ambient room temperature (24°C). Glycopyrrolate, like other anticholinergic (antimuscarinic) agents, inhibits the action of acetylcholine on structures innervated by postganglionic cholinergic nerves and on smooth muscles that respond to acetylcholine but lack cholinergic innervation. These peripheral cholinergic receptors are present in the autonomic effector cells of smooth muscle, cardiac muscle, the sinoatrial node, the atrioventricular node, exocrine glands and, to a limited degree, in the autonomic ganglia. Thus, it diminishes the volume and free acidity of gastric secretions and controls excessive pharyngeal, tracheal, and bronchial secretions. 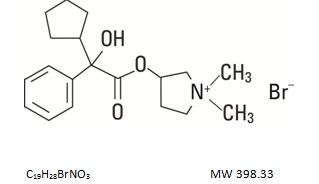 The highly polar quaternary ammonium group of glycopyrrolate limits its passage across lipid membranes, such as the blood-brain barrier, in contrast to atropine sulfate and scopolamine hydrobromide, which are highly non-polar tertiary amines which penetrate lipid barriers easily. With intravenous injection, the onset of action is generally evident within one minute. Following intramuscular administration, the onset of action is noted in 15 to 30 minutes, with peak effects occurring within approximately 30 to 45 minutes. The vagal blocking effects persist for 2 to 3 hours and the antisialagogue effects persist up to 7 hours, periods longer than for atropine. The following pharmacokinetic information and conclusions were obtained from published studies that used nonspecific assay methods. The mean volume of distribution of glycopyrrolate was estimated to be 0.42 ± 0.22 L/kg. The in vivo metabolism of glycopyrrolate in humans has not been studied. The mean clearance and mean T1/2 values were reported to be 0.54 ± 0.14 L/kg/hr and 0.83 ± 0.13 hr, respectively post IV administration. After IV administration of a 0.2 mg radiolabeled glycopyrrolate, 85% of dose recovered was recovered in urine 48 hours postdose and some of the radioactivity was also recovered in bile. After IM administration of glycopyrrolate to adults, the mean T1/2 value is reported to be between 0.55 to 1.25 hrs. Over 80% of IM dose administered was recovered in urine and the bile as unchanged drug and half the IM dose is excreted within 3 hrs. The following table summarizes the mean and standard deviation of pharmacokinetic parameters from a study. Gender differences in pharmacokinetics of glycopyrrolate have not been investigated. In one study glycopyrrolate was administered IV in uremic patients undergoing renal transplantation. The mean elimination half-life was significantly longer (46.8 minutes) than in healthy patients (18.6 minutes). The mean area-under-the-concentration-time curve (10.6 hr-μg/L), mean plasma clearance (0.43 L/hr/kg), and mean 3-hour urine excretion (0.7%) for glycopyrrolate were also significantly different than those of controls (3.73 hr-μg/L, 1.14 L/hr/kg, and 50%, respectively). These results suggest that the elimination of glycopyrrolate is severely impaired in patients with renal failure. Pharmacokinetic information in patients with hepatic impairment is unavailable. Following IV administration (5 μg/kg glycopyrrolate) to infants and children, the mean t1/2 values were reported to be between 21.6 and 130.0 minutes and between 19.2 and 99.2 minutes, respectively. 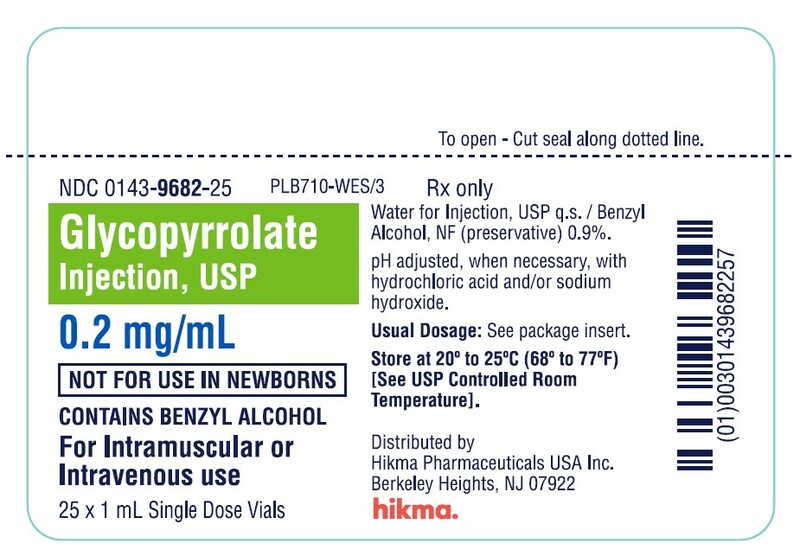 Glycopyrrolate Injection, USP is indicated for use as a preoperative antimuscarinic to reduce salivary, tracheobronchial, and pharyngeal secretions; to reduce the volume and free acidity of gastric secretions; and to block cardiac vagal inhibitory reflexes during induction of anesthesia and intubation. When indicated, Glycopyrrolate Injection, USP may be used intraoperatively to counteract surgically or drug-induced or vagal reflexes associated arrhythmias. Glycopyrrolate protects against the peripheral muscarinic effects (e.g., bradycardia and excessive secretions) of cholinergic agents such as neostigmine and pyridostigmine given to reverse the neuromuscular blockade due to non-depolarizing muscle relaxants. For use in adults as adjunctive therapy for the treatment of peptic ulcer when rapid anticholinergic effect is desired or when oral medication is not tolerated. Known hypersensitivity to glycopyrrolate or any of its inactive ingredients. In addition, in the management of peptic ulcer patients, because of the longer duration of therapy, glycopyrrolate injection may be contraindicated in patients with the following concurrent conditions: glaucoma; obstructive uropathy (for example, bladder neck obstruction due to prostatic hypertrophy); obstructive disease of the gastrointestinal tract (as in achalasia, pyloroduodenal stenosis, etc. ); paralytic ileus, intestinal atony of the elderly or debilitated patient; unstable cardiovascular status in acute hemorrhage; severe ulcerative colitis; toxic megacolon complicating ulcerative colitis; myasthenia gravis. This drug should be used with great caution, if at all, in patients with glaucoma. Exposure to excessive amounts of benzyl alcohol has been associated with toxicity (hypotension, metabolic acidosis), particularly in neonates, and an increased incidence of kernicterus, particularly in small preterm infants. There have been rare reports of deaths, primarily in preterm infants, associated with exposure to excessive amounts of benzyl alcohol. 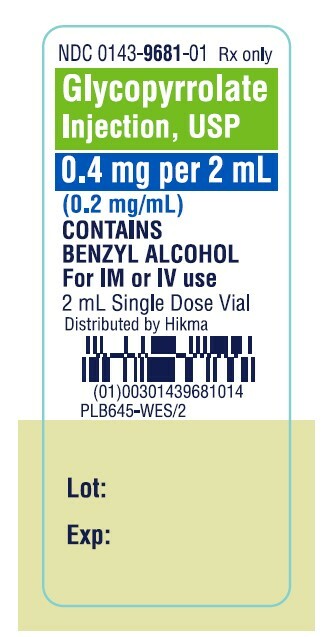 The amount of benzyl alcohol from medications is usually considered negligible compared to that received in flush solutions containing benzyl alcohol. Administration of high dosages of medications containing this preservative must take into account the total amount of benzyl alcohol administered. The amount of benzyl alcohol at which toxicity may occur is not known. If the patient requires more than the recommended dosages or other medications containing this preservative, the practitioner must consider the daily metabolic load of benzyl alcohol from these combined sources (see PRECAUTIONS, Pediatric Use). Glycopyrrolate injection may produce drowsiness or blurred vision. The patient should be cautioned regarding activities requiring mental alertness such as operating a motor vehicle or other machinery or performing hazardous work while taking this drug. In addition, in the presence of fever, high environmental temperature and/or during physical exercise, heat prostration can occur with use of anticholinergic agents including glycopyrrolate (due to decreased sweating), particularly in children and the elderly. Diarrhea may be an early symptom of incomplete intestinal obstruction, especially in patients with ileostomy or colostomy. In this instance treatment with glycopyrrolate injection would be inappropriate and possibly harmful. Investigate any tachycardia before giving glycopyrrolate injection since an increase in the heart rate may occur. Use with caution in patients with: coronary artery disease; congestive heart failure; cardiac arrhythmias; hypertension; hyperthyroidism. Use with caution in patients with renal disease since the renal elimination of glycopyrrolate may be severely impaired in patients with renal failure. Dosage adjustments may be necessary (see Pharmacokinetics, Renal Impairment). Use glycopyrrolate with caution in the elderly and in all patients with autonomic neuropathy, hepatic disease, ulcerative colitis, prostic hypertrophy, or hiatal hernia, since anticholinergic drugs may aggravate these conditions. The use of anticholinergetic drugs in the treatment of gastric ulcer may produce a delay in gastric emptying due to antral statis. 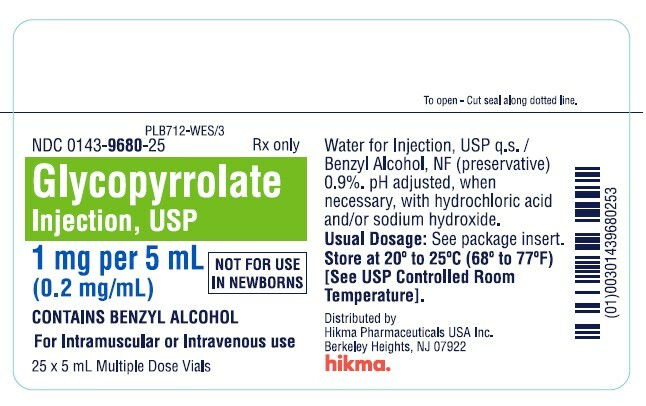 Because glycopyrrolate injection may produce drowsiness or blurred vision, the patient should be cautioned not to engage in activities requiring mental alertness and/or visual acuity such as operating a motor vehicle or other machinery, or performing hazardous work while taking this drug (see WARNINGS). The patient also should be cautioned about the use of this drug during exercise or hot weather since overheating may result in heat stroke. The patient may experience a possible sensitivity of the eyes to light. The concurrent use of glycopyrrolate injection with other anticholinergics or medications with anticholinergic activity, such as phenothiazines, antiparkinson drugs, or tricyclic antidepressants, may intensify the antimuscarinic effects and may result in an increase in anticholinergic side effects. Concomitant administration of glycopyrrolate injection and potassium chloride in a wax matrix may increase the severity of potassium chloride-induced gastrointestinal lesions as a result of a slower gastrointestinal transit time. Long-term studies in animals have not been performed to evaluate carcinogenic potential. Studies to evaluate the mutagenic potential of glycopyrrolate have not been conducted. In reproduction studies in rats, dietary administration of glycopyrrolate resulted in diminished rates of conception in a dose-related manner. Other studies in dogs suggest that this may be due to diminished seminal secretion which is evident at high doses of glycopyrrolate. Teratogenic Effects - Pregnancy Category B.
Reproduction studies with glycopyrrolate were performed in rats at a dietary dose of approximately 65 mg/kg/day (exposure was approximately 320 times the maximum recommended daily human dose of 2 mg on a mg/m2 basis) and rabbits at intramuscular doses of up to 0.5 mg/kg/day (exposure was approximately 5 times the maximum recommended daily human dose on a mg/m2 basis). These studies produced no teratogenic effects to the fetus. Because animal reproduction studies are not always predictive of human response, this drug should be used during pregnancy only if clearly needed. Single-dose studies in humans found that very small amounts of glycopyrrolate passed the placental barrier. Published literature suggest the following regarding the use of glycopyrrolate during pregnancy. Unlike atropine, glycopyrrolate in normal doses (0.004 mg/kg) does not appear to affect fetal heart rate or fetal heart rate variability to a significant degree. Concentrations of glycopyrrolate in umbilical venous and aterial blood and in the amniotic fluid are low after intramuscular administration to parturients. Therefore, glycopyrrolate does not appear to penetrate through the placental barrier in significant amounts. In reproduction studies in rats, dietary administration of glycopyrrolate resulted in diminished rates of pup survival in a dose-related manner. It is not known whether this drug is excreted in human milk. Because many drugs are excreted in human milk, caution should be exercised when glycopyrrolate injection is administered to a nursing woman. As with other anticholinergics, glycopyrrolate may cause suppression of lactation (see ADVERSE REACTIONS). 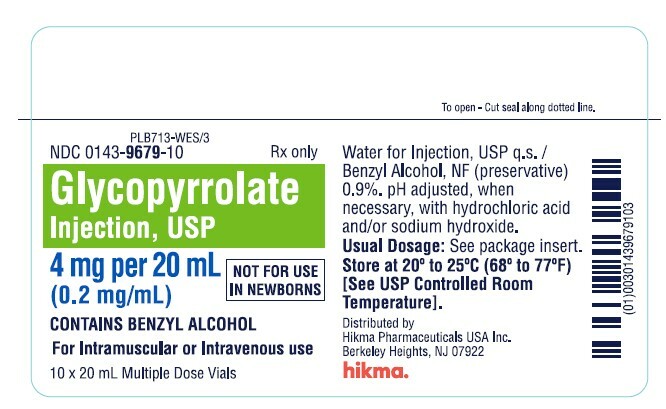 Due to its benzyl alcohol content, glycopyrrolate injection should not be used in neonates, i.e., patients less than 1 month of age. Safety and effectiveness in pediatric patients have not been established for the management of peptic ulcer. Dysrhythmias associated with the use of glycopyrrolate intravenously as a premedicant or during anesthesia have been observed in pediatric patients. Infants, patients with Down’s syndrome, and pediatric patients with spastic paralysis or brain damage may experience an increased response to anticholinergics, thus increasing the potential for side effects. A paradoxical reaction characterized by hyperexcitability may occur in pediatric patients taking large doses of anticholinergics including glycopyrrolate injection. Infants and young children are especially susceptible to the toxic effects of anticholinergics. Benzyl alcohol, a component of this drug product, has been associated with serious adverse events and death, particularly in pediatric patients. The “gasping syndrome", (characterized by central nervous system depression, metabolic acidosis, gasping respirations, and high levels of benzyl alcohol and its metabolites found in the blood and urine) has been associated with benzyl alcohol dosages >99 mg/kg/day in neonates and low-birth-weight neonates. Additional symptoms may include gradual neurological deterioration, seizures, intracranial hemorrhage, hemotologic abnormalities, skin breakdown, hepatic and renal failure, hypotension, bradycardia, and cardiovascular collapse. Although normal therapeutic doses of this product deliver amounts of benzyl alcohol that are substantially lower than those reported in association with the “gasping syndrome”, the minimum amount of benzyl alcohol at which toxicity may occur is not known. Premature and low-birthweight infants, as well as patients receiving high dosages, may be more likely to develop toxicity. Practitioners administering this and other medications containing benzyl alcohol should consider the combined daily metabolic load of benzyl alcohol from all sources. Clinical Studies of glycopyrrolate injection did not include sufficient numbers of subjects aged 65 and over to determine whether they respond differently from younger subjects. Other reported clinical experience has not identified differences in responses between the elderly and younger patients. In general, dose selection for an elderly patient should be cautious, usually starting at the low end of the dosing range, reflecting the greater frequency of decreased hepatic, renal, or cardiac function, and of concomitant disease or other therapy. Anticholinergics, including glycopyrrolate injection, can produce certain effects, most of which are extensions of their pharmacologic actions. Adverse reactions may include xerostomia (dry mouth); urinary hesitancy and retention; blurred vision and photophobia due to mydriasis (dilation of the pupil); cycloplegia; increased ocular tension; tachycardia; palpitation; decreased sweating; loss of taste; headache; nervousness; drowsiness; weakness; dizziness; insomnia; nausea; vomiting; impotence; suppression of lactation; constipation; bloated feeling; severe allergic reactions including anaphylactic/anaphylactoid reactions; hypersensitivity; urticaria, pruritus, dry skin, and other dermal manifestations; some degree of mental confusion and/or excitement, especially in elderly persons. In addition, the following adverse events have been reported from post-marketing experience with glycopyrrolate: malignant hyperthermia; cardiac arrhythmias (including bradycardia, ventricular tachycardia, ventricular fibrillation); cardiac arrest; hypertension; hypotension; seizures; and respiratory arrest. Post-marketing reports have included cases of heart block and QTc interval prolongation associated with the combined use of glycopyrrolate and an anticholinesterase. Injection site reactions including pruritus, edema, erythema, and pain have also been reported. Glycopyrrolate is chemically a quaternary ammonium compound; hence, its passage across lipid membranes, such as the blood-brain barrier is limited in contrast to atropine sulfate and scopolamine hydrobromide. For this reason the occurrence of CNS-related side effects is lower, in comparison to their incidence following administration of anticholinergics which are chemically tertiary amines that can cross this barrier readily. To report SUSPECTED ADVERSE REACTIONS, contact West-Ward Pharmaceutical Corp. at 1-877-233-2001, or FDA at 1-800‑FDA‑1088 or www.fda.gov/medwatch. To combat peripheral anticholinergic effects, a quaternary ammonium anticholinesterase such as neostigmine methylsulfate (which does not cross the blood-brain barrier) may be given intravenously in increments of 0.25 mg in adults. This dosage may be repeated every five to ten minutes until anticholinergic overactivity is reversed or up to a maximum of 2.5 mg. Proportionately smaller doses should be used in pediatric patients. Indication for repetitive doses of neostigmine should be based on close monitoring of the decrease in heart rate and the return of bowel sounds. If CNS symptoms (e.g., excitement, restlessness, convulsions, psychotic behavior) occur, physostigmine (which does cross the blood–brain barrier) may be used. Physostigmine 0.5 to 2 mg should be slowly administered intravenously and repeated as necessary up to a total of 5 mg in adults. Proportionately smaller doses should be used in pediatric patients. To combat hypotension, administer IV fluids and/or pressor agents along with supportive care. Fever should be treated symptomatically. Following overdosage, a curare-like action may occur, i.e., neuromuscular blockade leading to muscular weakness and possible paralysis. In the event of a curare-like effect on respiratory muscles, artificial respiration should be instituted and maintained until effective respiratory action returns. NOTE: CONTAINS BENZYL ALCOHOL (see PRECAUTIONS). Glycopyrrolate injection may be administered intramuscularly, or intravenously, without dilution, in the following indications. The recommended dose of glycopyrrolate injection is 0.004 mg/kg by intramuscular injection, given 30 to 60 minutes prior to the anticipated time of induction of anesthesia or at the time the preanesthetic narcotic and/or sedative are administered. Glycopyrrolate injection may be used during surgery to counteract drug-induced or vagal reflexes and their associated arrhythmias (e.g., bradycardia). It should be administered intravenously as single doses of 0.1 mg and repeated, as needed, at intervals of 2 to 3 minutes. The usual attempts should be made to determine the etiology of the arrhythmia, and the surgical or anesthetic manipulations necessary to correct parasympathetic imbalance should be performed. The recommended dose of glycopyrrolate injection is 0.2 mg for each 1.0 mg of neostigmine or 5.0 mg of pyridostigmine. In order to minimize the appearance of cardiac side effects, the drugs may be administered simultaneously by intravenous injection and may be mixed in the same syringe. The usual recommended dose of glycopyrrolate injection is 0.1 mg administered at 4-hour intervals, 3 or 4 times daily intravenously or intramuscularly. Where more profound effect is required, 0.2 mg may be given. Some patients may need only a single dose, and frequency of administration should be dictated by patient response up to a maximum of four times daily. Glycopyrrolate injection is not recommended for the treatment of peptic ulcer in pediatric patients (see PRECAUTIONS, Pediatric Use). The recommended dose of glycopyrrolate injection in pediatric patients is 0.004 mg/kg intramuscularly, given 30 to 60 minutes prior to the anticipated time of induction of anesthesia or at the time the preanesthetic narcotic and/or sedative are administered. (1 month to 2 years of age) may require up to 0.009 mg/kg. Because of the long duration of action of glycopyrrolate injection if used as preanesthetic medication, additional glycopyrrolate injection for anticholinergic effect intraoperatively is rarely needed; in the event it is required the recommended pediatric dose is 0.004 mg/kg intravenously, not to exceed 0.1 mg in a single dose which may be repeated, as needed, at intervals of 2 to 3 minutes. The usual attempts should be made to determine the etiology of the arrhythmia, and the surgical or anesthetic manipulations necessary to correct parasympathetic imbalance should be performed. The recommended pediatric dose of glycopyrrolate injection is 0.2 mg for each 1.0 mg of neostigmine or 5.0 mg of pyridostigmine. In order to minimize the appearance of cardiac side effects, the drugs may be administered simultaneously by intravenous injection and may be mixed in the same syringe. Dextrose 5% and 10% in water, or saline, dextrose 5% in sodium chloride 0.45%, sodium chloride 0.9%, and Ringer’s Injection. This list does not constitute an endorsement of the clinical utility or safety of co‑administration of glycopyrrolate with these drugs. Glycopyrrolate injection is compatible for mixing and injection with the following injectable dosage forms: atropine sulfate, USP; physostigmine salicylate; diphenhydramine HCl; codeine phosphate, USP; benz-quinamide HCl; hydromorphone HCl, USP; droperidol; levorphanol tartrate; lidocaine, USP; meperidine HCl, USP; pyridostigmine bromide; morphine sulfate, USP; nalbuphine HCl; oxymorphone HCl; procaine HCl, USP; promethazine HCl, USP; neostigmine methylsulfate, USP; scopolamine HBr, USP; butorphanol tartrate; fentanyl citrate; trimethobenzamide HCl; and hydroxyzine HCl. Glycopyrrolate injection may be administered via the tubing of a running infusion of normal saline. 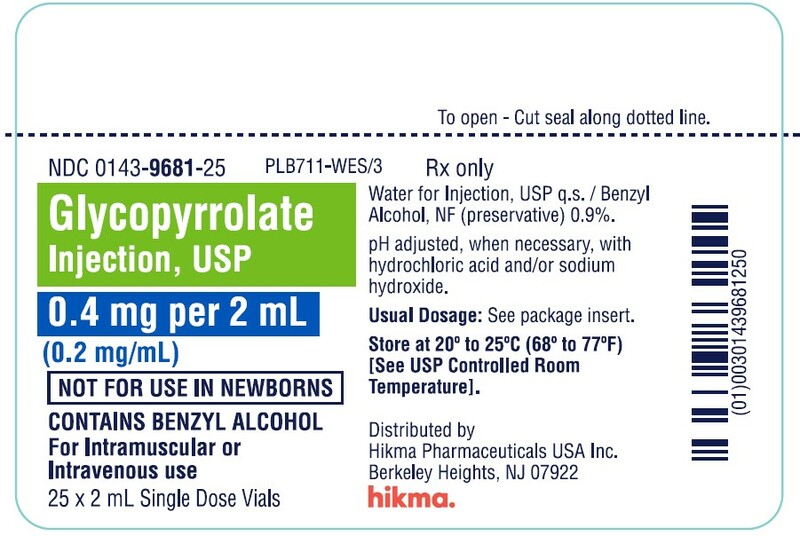 Since the stability of glycopyrrolate is questionable above a pH of 6.0 do not combine glycopyrrolate injection in the same syringe with methohexital Na; chloramphenicol Na succinate; dimenhydrinate; pentobarbital Na; thiopental Na; secobarbital Na; sodium bicarbonate; diazepam; dexamethasone Na phosphate; or pentazocine lactate. These mixtures will result in a pH higher than 6.0 and may result in gas production or precipitation. Manufactured by: HIKMA FARMACÊUTICA (PORTUGAL), S.A.